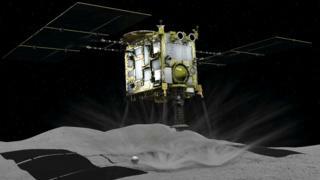 Hayabusa-2 is expected to return to Earth in 2020 along with its rocky hoard. During sample collection, the spacecraft approached the 1km-wide asteroid with an instrument called the sampler horn. On touchdown, a 5g “bullet” made of the metal tantalum was fired into the rocky surface at 300m/s. “We made a successful touchdown, including firing a bullet,” said Hayabusa-2 project manager Yuichi Tsuda. The spacecraft began descending from its “home position” of 20km above the asteroid’s surface in the early hours of 21 February (GMT) – several hours later than planned.